when Kim noticed an area manager. 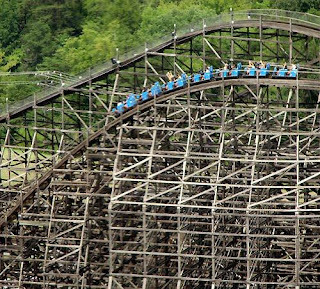 So we started screaming, and as soon as we went down, we ducked our heads down. We got back, and the manager was right there. (luckily we did not get in trouble). After my eighth ride and Kim's fourth, we were forced to stop riding. I started sweeping. All of a sudden, Kim popped out of the red bin that holds riders' stuff. I looked at her for a minute, then I screamed. (Delayed reaction). After I recovered from my myocardial malfunction (heart attack), I ran through the gates, and got in the other side of the bin. Once I closed the lid, I remembered I was claustrophobic. We waited for Tonya to come back. And then Kim popped out, then I popped out. Tonya started laughing at us. 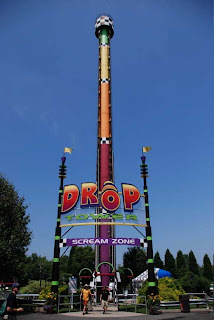 Then we all ended up at Drop Tower (I did not sneak down there so I didn't have to clean under The Hurler). (Okay, I totally did). 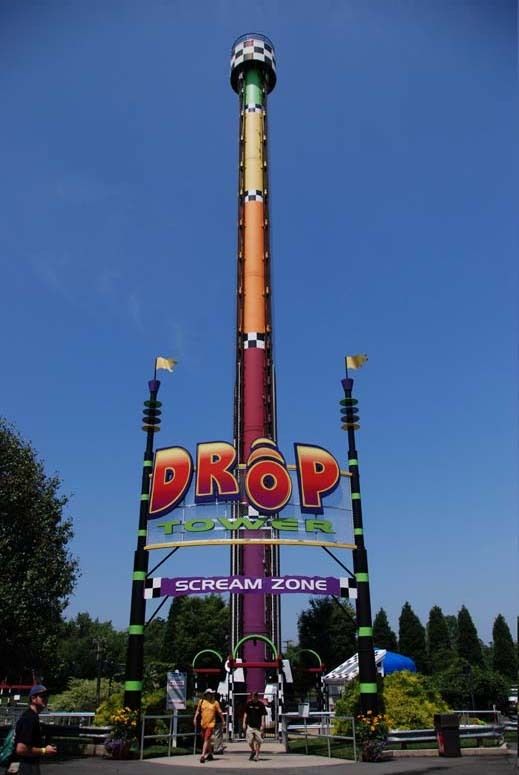 I attempted to trick Taylor Y. into riding Drop Tower by himself, but I didn't realize that Kim had already planned to force me to ride it. Kim grabbed me by the arm, and tried to drag me. When I started fighting, Tonya grabbed me, and the carried me on the ride. I almost made an escape when Kim opened the seats to let Preston on, but the stupid seatbelt wouldn't unbuckle in time. This is what I was forced on. Let's just say even though the ride is 162 feet in the air, you could still hear me screaming at Kim and Tonya. When I got down, I attacked Kim, and she threw me in the fence, where my clumsy self hit my head on a pole.